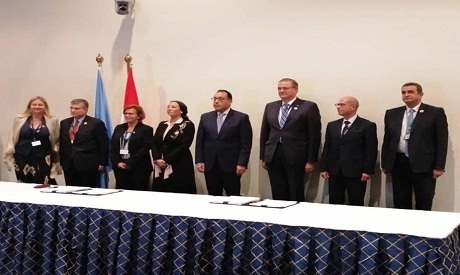 The Egyptian Ministry of Environment signed on Wednesday two agreements with the United Nations Development Fund on biodiversity and environmental conservation in Egypt. The signing was attended by Egyptian Prime Minister Mostafa Madbouly. "The two agreements on the inclusion of biodiversity , environmental conservation and its sustainable use in tourism development and operations in threatened ecosystems in Egypt goes in line with the framework of United Nations Climate Change Conference agreement," said the director of the United Nations Development Programme (UNDP) in Egypt Randa Abul-Hassan. "The first project is funded by the Global Environment Facility aiming to mainstream biodiversity in the Egyptian tourism sector and within the Egyptian government," Abul-Hassan said. "Biodiversity represents a very important factor for life on earth and enhancing ecosystem productivity to protect the planet. Egypt is undertaking serious steps to preserve biodiversity and we are proud to receive support and share our expertise in this field." "The first project led to significant changes for managing tourism resources and biodiversity in the future," she said. "The second project will enable Egypt to prepare its fourth national communiqué and submit it to the United Nations Climate Change Conference Agreement, based on its commitments to the agreement." The two projects, worth $3 million, are to be implemented by the Egyptian Environmental Affairs Agency. Egypt opened the African Biodiversity Summit on 13 November, which is held in the run-up to the UN Biodiversity Conference COP14, which runs from 17 to 29 November in the Red Sea resort city of Sharm El-Sheikh. During the African summit, environment ministers and key partners aim to tackle and offer policy and strategic guidance on Africa’s biodiversity priorities as well as promote synergetic implementation of the three Rio conventions; the Convention on Biological Diversity (CBD), the United Nations Convention to Combat Desertification (UNCCD) and the United Nations Framework Convention on Climate Change‎ (UNFCCC), according to the conference's official website.